Our fellow hackers in Broomfield, CO (near Denver) are looking to finally get their hackerspace off the ground and into a physical space. They’re using kickstarter to get themselves out of one of the officer’s garage, and into a space of their own. Check out their Kickstarter here and consider throwing them some dosh! EDIT: They successfully raised $18,669, which exceeded their original goal, but fell short of their first stretch goal. 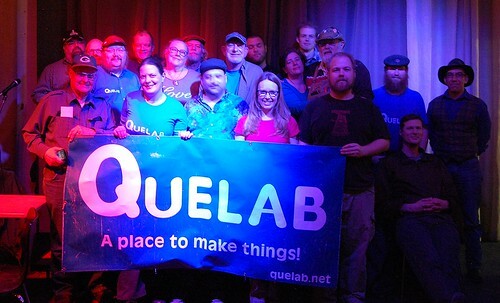 The next Quelab community meeting is scheduled for Sunday 2 August 2015 at 4:00 PM. Please bring something for the potluck at 4:00PM, and we’ll start the meeting at 5PM. If there is anything you would like to discuss at the meeting, bring it up to one of the officers, and we’ll put it on the agenda.